As the grim tolling of bells peals out of the bellfry, snarling gargoyles and faceless statues seem to somehow acknowledge your arrival. Towering pillars cast long shadows in the dimly lit gloom of these towering halls. Somewhere a demonic choir sings a blasphemous hymnal as the rotting corpses of sinners and devils line the pews. Don’t lower your head! Don’t fall to your knees! And don’t bother praying… it won’t help you now. This is Cathedrae Noctis… where even angels fear to tread! 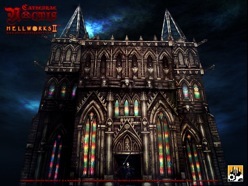 Cathedrae Noctis brings your darkest, gothic fantasies to life! With it’s optional wall types you could make towering structures that dwarf all other terrain on the table or make a simple shrine or chapel with equal ease! Even ruined buildings are no problem with the EZ-Kitbashing guide included! Colourful stained glass windows with monstrous themes add depth and atmosphere to your model and props galore provide both extra detail and vital in-game cover, ranging from simple candelabras to the very heart of darkness itself! And as always, fully photographed, step-by-step instructions to guide you through the assembly process!